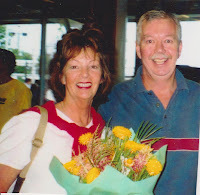 "I've seen fire and I've seen rain.....but I always thought I'd see you again" was the song running through my head as we made our way over the Pacific and down under the northern hemisphere to Sydney, Australia in 2002. A gift from my husband to finally visit my oldest brother in his adopted country; the place he's called home for years. Now, 14 years later, I'm going back. This time I hear the words "when you see the Southern Cross for the first time, you understand now why you came this way." And I understand why I need to return. My brother came to the US every few years to visit our parents; they in turn visited him several times, accepting the fact he was an Aussie citizen and embracing his new homeland. But I haven't seen him since 2010 when Mom passed away. So off I go. Solo. I'm packed and have taken care of last minute details...spray tanned, nails done, bills paid, love notes written to my kids and grandkids. I made copies of my passport, visa, insurance card and driver license for my brother and son...just in case. I'll be checking the suitcase. 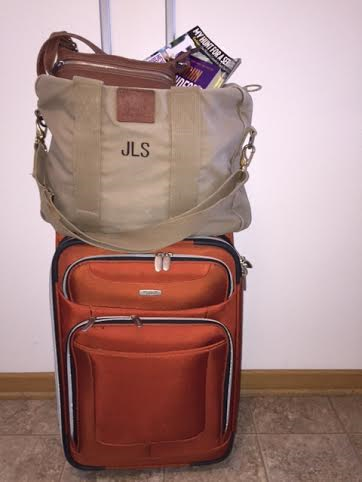 This carry-on, (my old Land's End briefcase,) holds pj's, a change of clothes, magazines, book and sandals. I'm spending three nights in the Holiday Inn Old Sydney upon arrival and want to be prepared if luggage is delayed. I'll add my makeup bag and tablet at the last minute. My cross body-bag fits nicely too. I like being hands free when walking through airports and taking taxis for minimum schlepping! I've got scrapbooks and journals from my last visit to Straya or Strain (Australia)...Aussies abbreviate or rework every word they can. I'm a Stickybeak...nosy and always asking questions! 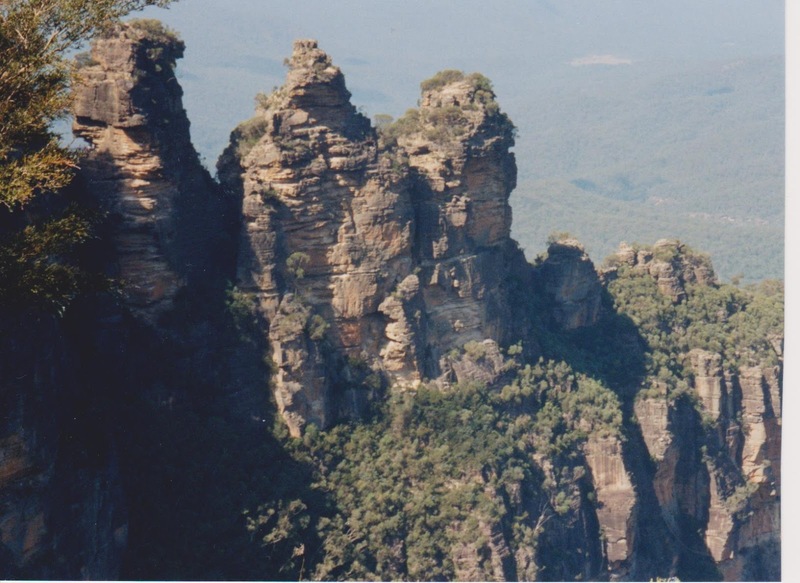 Katoomba train station, Blue Mts. 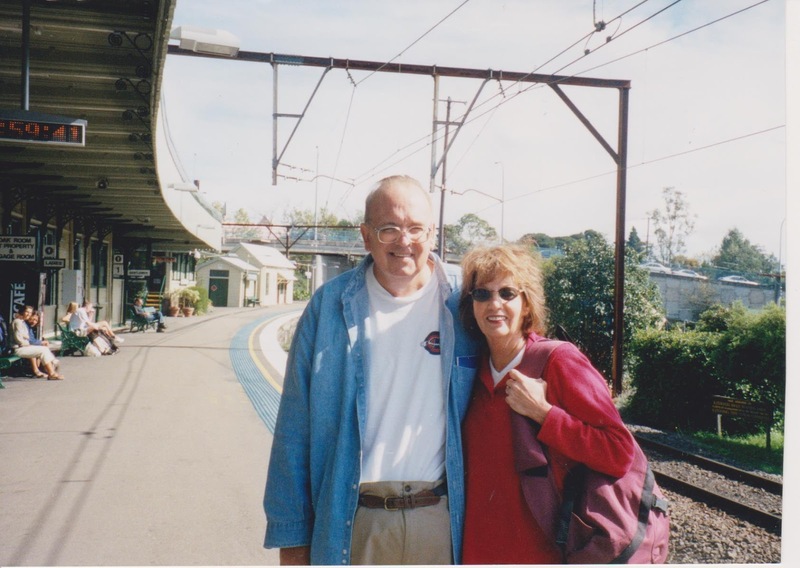 After spending two nights in the Blue Mountains with my brother and sister-in-law, Jim and I took the train to Sydney Airport and caught a flight to Coffs Harbour to visit dear friends we met at the 96 Olympics in Atlanta. In addition to touring a banana plantation in this equatorial rain forest region; we pet koalas at the zoo and wandered an animal preserve feeding wallabies and roos. 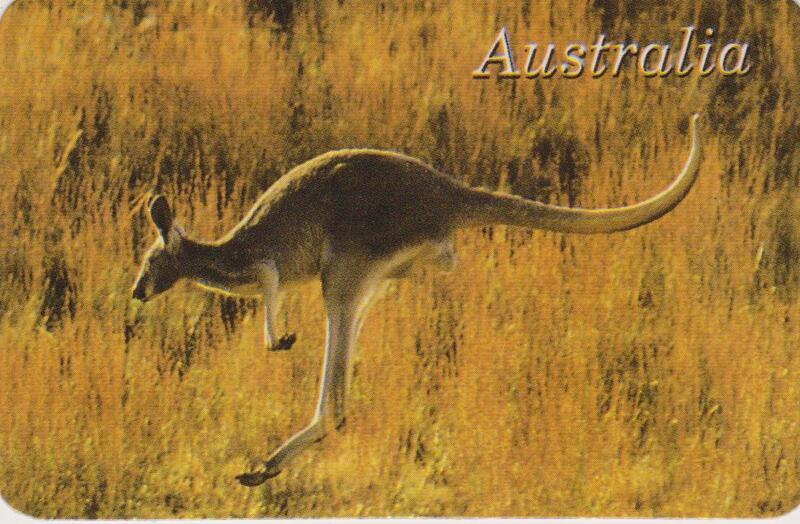 An interesting fact we learned back then was that Australia is a big exporter of sand and camels! I'll have a chance to ride a camel during an Ayers Rock sunrise this trip! I was teaching fourth grade in 2002; so I hooked up with the lead teacher taking students on a tour of the Opera House one afternoon. Another day I spent in a fourth grade classroom of the Brisbania Primary School; engaging with lessons and securing pen pals for my students back home. 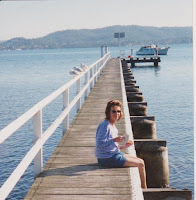 My brother's house is just up from this jetty where we'd have our cuppa each morning. His home has been designated historic landmark status and he takes great pride in authenticity and quality. They've also a studio on the grounds where my sister-in-law paints. An accomplished artist, she's written and illustrated several books, written articles and teaches community art classes. She is conducting an artist's retreat on Norfolk Island this first week in March, 2016. During my parents' last visit in the spring of 2001, my father had a mild heart attack. He finally recovered and became well enough to return to the states. His greatest disappointment was not being able to do the Sydney Harbor Bridge Climb with my brother. As the tickets were transferable at that time and good for a year; it became my 'job' to climb for my dad. Climbing it was the greatest thrill of my life....and the scariest thing I've ever done! But the sense of awe and accomplishment created a need within my soul to always be doing, to try new things, to defy age, to overcome fears. Knowing it meant so much to my father was priceless. "I can't believe I did it" I said over and over as we downed gin and tonics at the nearest pub! Butterflies flutter a bit as the countdown to departure begins. I fly alone often and I've made this long journey before....but there's a sense of emptiness; that something is missing. Grief in disguise? 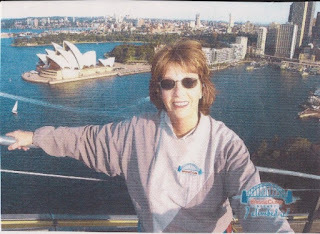 My husband held my hand as we sat on the steps overlooking Sydney Harbor on our last night; the Opera House over his shoulder, the Harbor Bridge over mine. "We're coming back someday, " he promised. I know I'm also going for him. 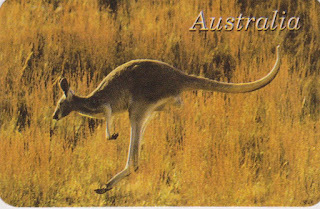 He'll be in my heart, smiling at my brother's jokes and Aussie slang. In addition to a three night stay at the Desert Gardens Resort and the camel ride; I'm looking forward to meeting blogging friends in real life who've offered to meet me in Sydney for coffee or wine. 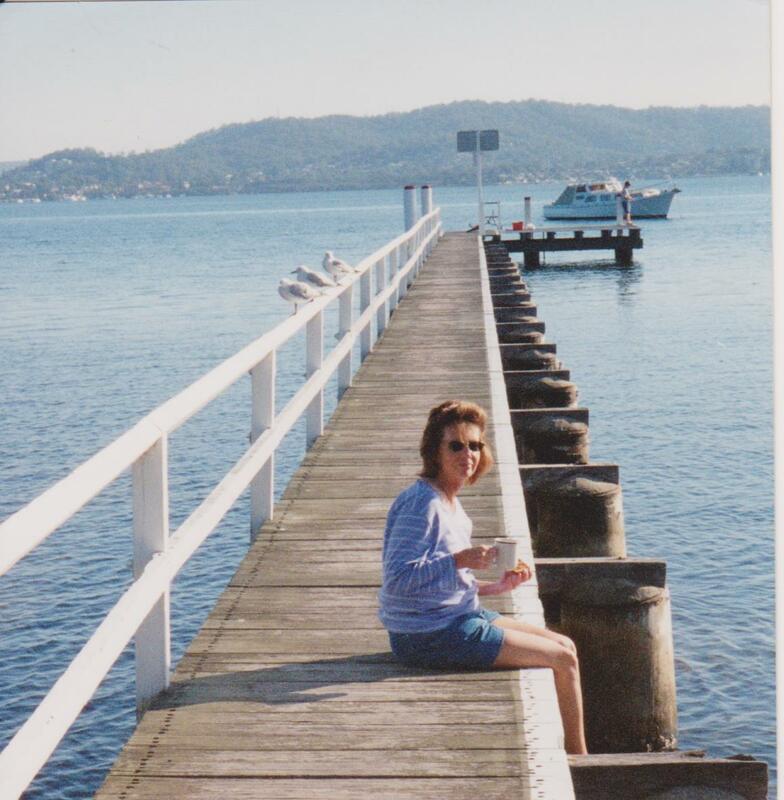 And how cool will it be to meet my sweet and sunny girlfriend from high school days as she and her husband disembark from their Singapore to Sydney cruise and spend a day with me! But mostly this trip is about family; about catching up on our lives, about sharing childhood memories and making new ones as the end of our third quarter looms. Another verse I like from the Crosby, Stills and Nash's song goes like this; "the truth you might be running from is so small. But it's as big as the promise...the promise of a coming day." I think this fluttering is anticipation in disguise! Have a great trip. I enjoyed reading this and seeing how your family has been divided and united by cross cultural living and loving. Beautiful thought here... divided, united, cross cultural living and loving! That's us. Thank you for this, Pat! Have a wonderful time! Can't believe you did the bridge climb! That is so brave! Not sure if I could do it! It was amazing and scary! I was brave, but wouldn't look down till the very end! Thanks for your good wishes, Lynne! I'm at LAX waiting to bosrd.....be there Thursday morning. Going back and facing ghosts isn't always easy -- have fun! I'm hoping it'll be happy nostalgia and not too sad. Thanks, Kc. I feel like we need to take a trip together. I don't know why, but that strikes me. Enjoy your time...be strong.